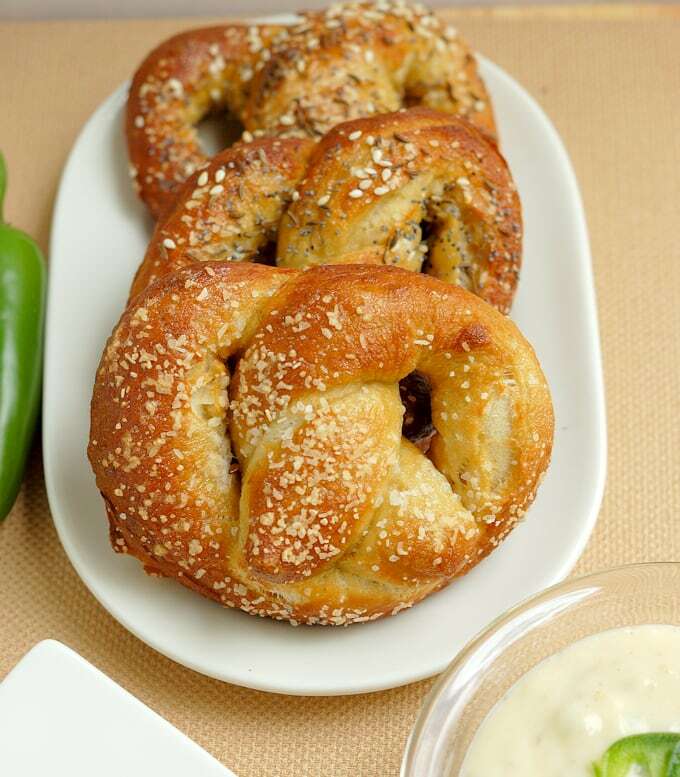 Yeasty soft pretzels get an extra boost of flavor from a cup of beer in the dough. 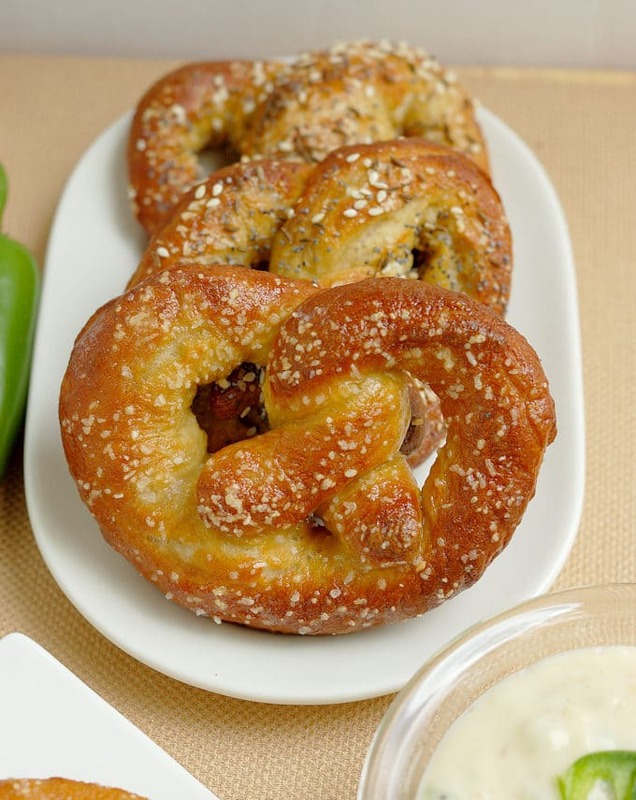 Top these Beer Infused Bavarian Soft Pretzels with coarse salt or an “everything” seed mix. 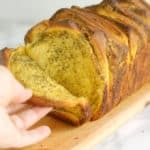 Serve with a warm Jalapeno Cheddar Dip or a squiggle of mustard. Of course they go perfectly with a cold beer. This post is by special request of my husband. We dine fairly regularly at a brew pub in the neighborhood. 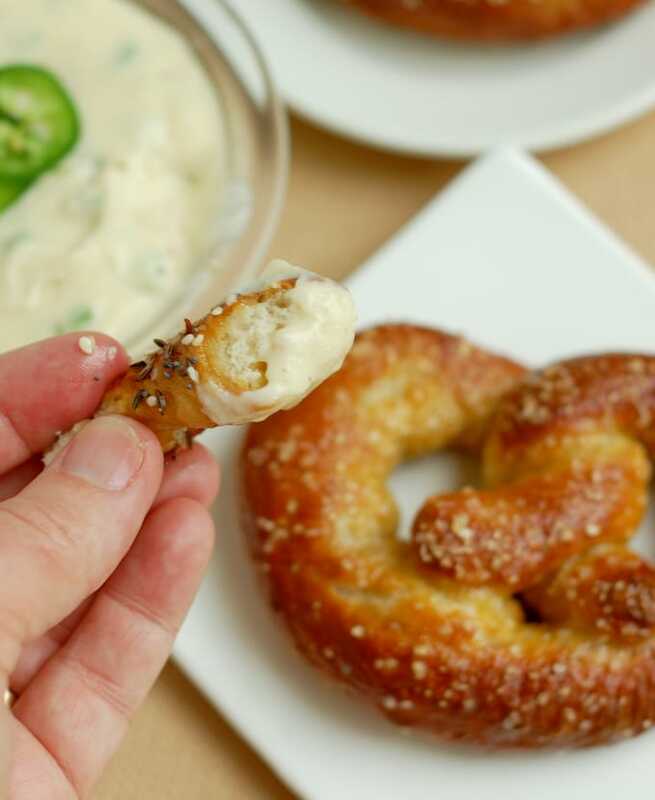 We keep going back not only because they have so many great craft brews on tap, but also for our favorite appetizer of warm Bavarian Pretzels with Jalapeno Cheddar Dip. 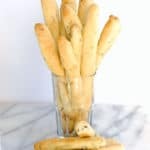 During our last visit we were gobbling up the pretzels and my husband suggested I recreate the recipe for the blog. Challenge accepted! I figured if beer is so good with a pretzel, it should also be good in a pretzel. The idea is something I’ve played with before. My sourdough Bread Starter was made with the mash left over from my son’s beer making, and it makes a fabulous loaf of bread. This recipe was adapted from the many recipes I found on-line, switching out most of the water for beer. The beer gives the pretzels a really nice flavor. 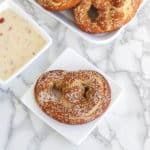 Don’t skip boiling the pretzels in the baking-soda-water since that’s what gives a pretzel the singular crust and color that makes it a pretzel rather than a roll with a funny shape. 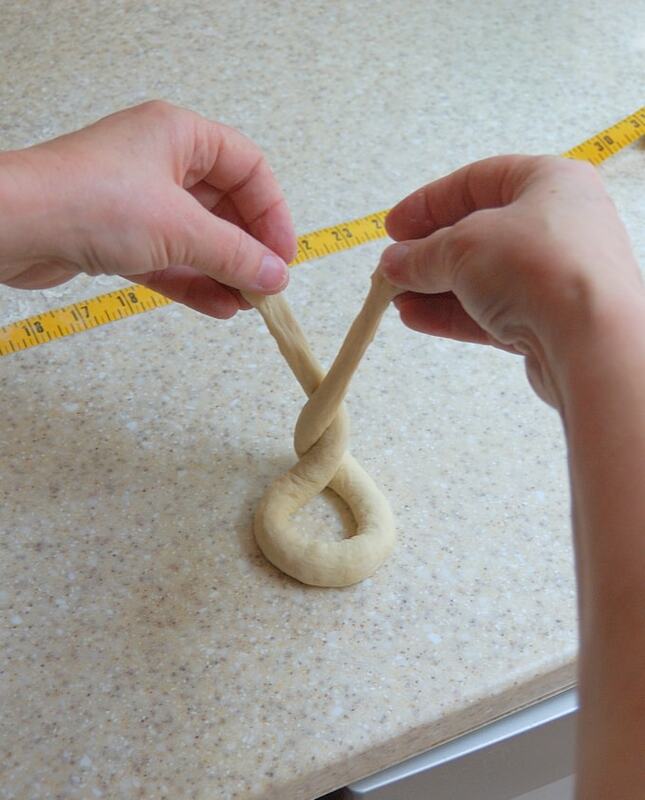 You can see how to shape and handle the pretzels in the photos in this post. The only other word of caution is to make sure to oil the parchment paper. Normally nothing sticks to parchment – I’m not sure why, but the pretzels stuck like crazy when I baked them on un-oiled parchment. If you have a silpat that may work, but I didn’t try it so can’t say for sure. 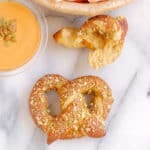 Jalapeno Cheddar Dip is the prefect partner for these pretzels. You can leave out the jalapeno if you don’t want any heat. 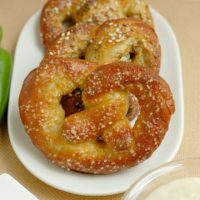 You can also serve Beer Infused Bavarian Soft Pretzels with your favorite mustard or dip. So pour yourself a cold-one and enjoy! 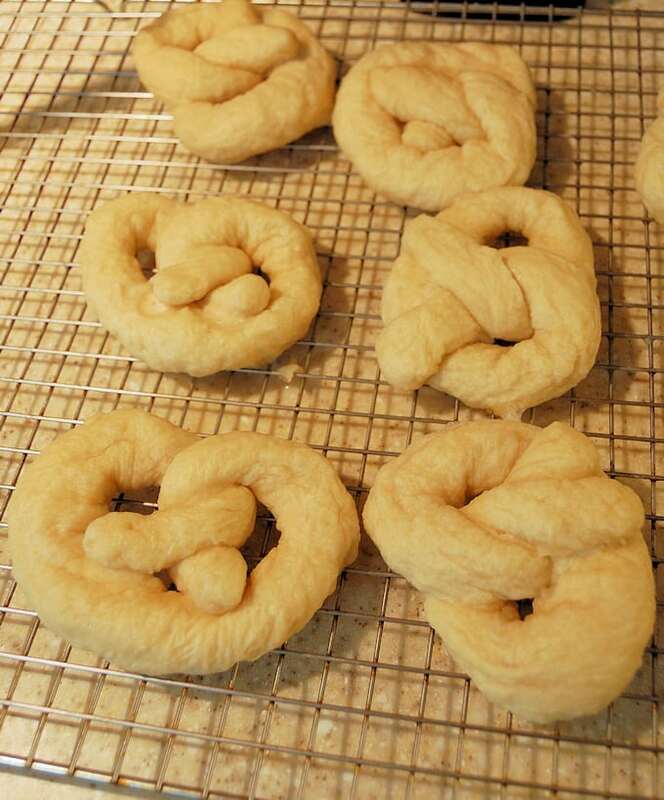 Yeasty soft pretzels get an extra boost of flavor from a cup of beer in the dough. 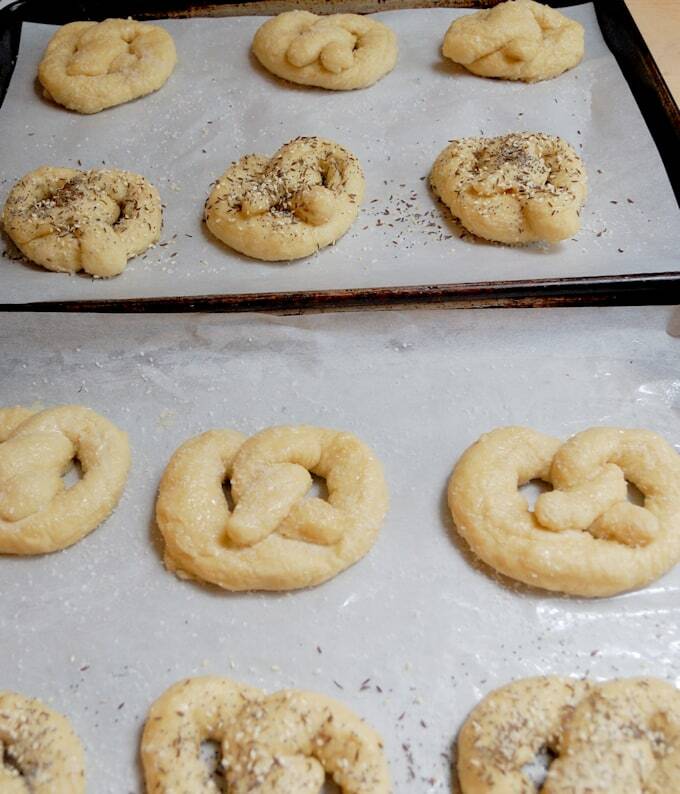 Top these Beer Infused Bavarian Soft Pretzels with coarse salt or an "everything" seed mix. 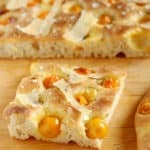 Serve with a warm Jalapeno Cheddar Dip or a squiggle of mustard. Of course they go perfectly with a cold beer. 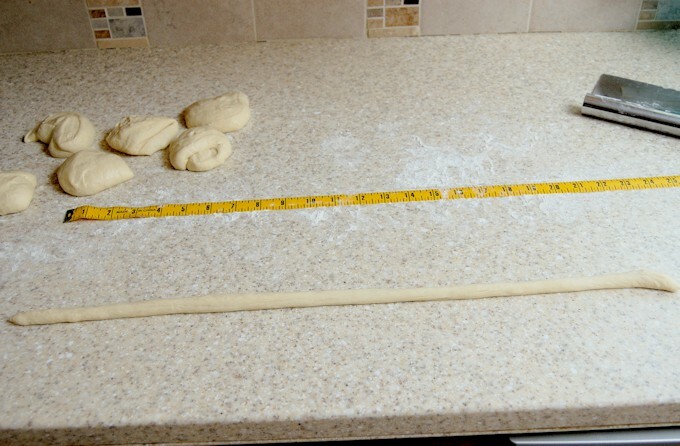 Switch to the dough hook and add the remaining flour until the dough gathers on the hook and clears the sides of the bowl. Combine the 2 quarts of water and baking soda in a large pot. 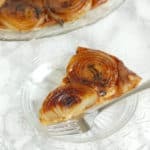 Preheat the oven to 450°F convection or 475°F regular. Once the baking soda water is boiling drop the pretzels into the water for 30 seconds. (I can fit about 3 at a time in my pot, don't overcrowd the pan). 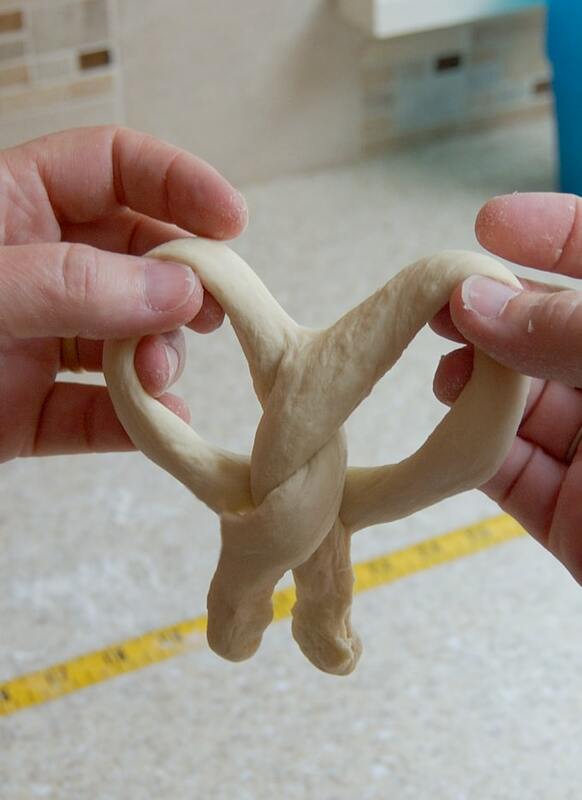 Brush each pretzel with egg white and sprinkle with coarse salt, and seeds of your choice. 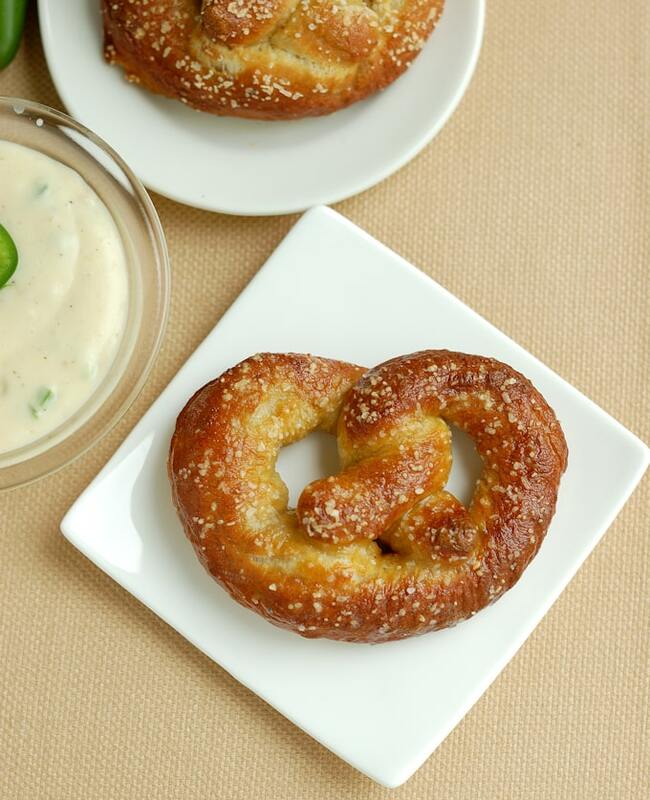 Enjoy them warm with Jalapeno Cheddar Dip, mustard, or your favorite pretzel dip. This dip is also delicious made with pickled jalapenos. These sound (and look) amazing! 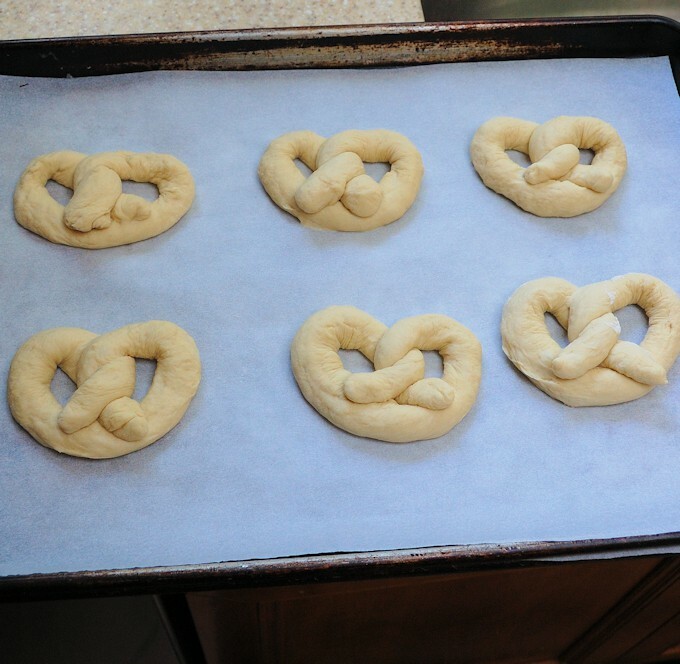 I have yet to try my hand at soft pretzels so I will definitely be giving these a try (although I suspect my husband will insist that I shape them like Philadelphia-style soft pretzels!). I hope you try them, Julie. The beer gives them an extra special flavor, no matter how you shape them.